In stock -This product will ship today if ordered within the next 4 hours and 12 minutes. This high-performance Dishwasher Rinse Aid can be used in all types of dishwashing machines - it’s cost-effective and ensures gorgeous, gleaming results each time. Hypoallergenic and suitable for sensitive skin. Also fragrance free. 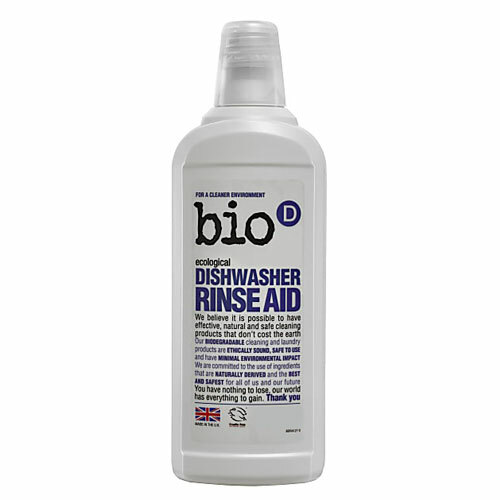 Fill the rinse aid reservoir of your dishwasher with Bio-D Rinse Aid in accordance with the machine manufacturer’s instructions. Check the rinse aid level regularly to ensure crockery and cutlery maintain a clean, shiny finish. Remove scraps of food, place one level scoop of Dishwasher detergent in to the machine’s dispenser. Ensure the machine’s rinse aid reservoir is filled with Bio-D Rinse Aid. Always follow the machine manufacturer’s instructions. 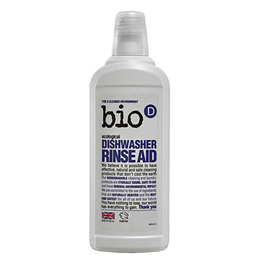 Below are reviews of Bio D Dishwasher Rinse Aid - 750ml by bodykind customers. If you have tried this product we'd love to hear what you think so please leave a review. Leaves my hair shiny and soft, definitely recommend. To be used along with the Bio D powder and costs a lot less than expensive branded rinse aids. A pity the tops are not more secure as the bottles are filled up to the top and can leak in transit.